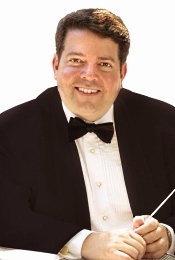 Heidi Grant Murphy and Petra Lang, soloists; Andrew Litton, Dallas Symphony Orchestra and Chorus. Delos DE 3237 (2 CDs). 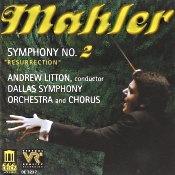 Mahler's Second Symphony "Resurrection" was his first really massive work, not only long but incorporating the talents of a large orchestra, soloists, and chorus. Such size became his eventual trademark, the quintessential "big, Mahler symphony." In order for any new recording to do it justice, the performance must stand up to at least two towering predecessors, those of Otto Klemperer and Sir Simon Rattle, both on EMI. Klemperer imparted a feeling of monumental grandeur to Man's triumph over death, while Rattle provided an even greater sense of spirituality in the process. Andrew Litton does not ascend these lofty peaks without the difficulty of comparison; he comes off second best. For me, Litton is in trouble from the beginning. He takes the opening Allegro, a signature funeral march for Mahler, much too slowly. Certainly, a funeral dirge should be solemn, but it should never drag. This one dawdles along at what seems an interminable pace without much recourse to any punctuation of lines; there is little sense of drama or scope in the reading of this initial movement. Then things improve. Litton gives the three middle sections a more affecting treatment, never mind that the second segment, a Landler or slow waltz, as Mahler wrote it seems worlds apart from the rest of the work's symphonic content. The soloist performs well in the fourth movement, the famous "Urlicht" song from Des Knaben Wunderhorn. The major letdown, however, is in the finale, which has nothing like the elation and exaltation it demands. 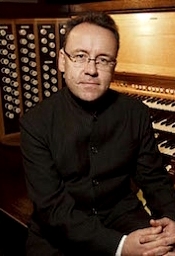 Rather, Litton just seems to let the music fall as notes from a page; it's not lifeless but not exhilarating, either, in spite of a full chorus, soloists, and organ thundering behind the orchestra. Delos present the symphony with their Virtual Reality processing, whereby the music was originally recorded in multiple channels and mixed down into two for playback either on regular two-channel stereo equipment or in various multichannel formats like Dolby Pro Logic. I did not try it in surround mode as my multichannel home theater system is not really up to the musical standards of my separate stereo music system. I rather suspect, though, that some of the sound's thicker qualities in regular playback are due to its abundance of multiple resonances. Anyway, Delos recorded the symphony live at the Eugene McDermott Concert Hall of the Morton H. Myerson Symphony Center, Dallas, Texas in September 1998. The sound they obtained is quite natural in frequency response and smooth in all extremes, but it lacks the overall clarity of the much older Klemperer disc I've mentioned. The chorus in the finale of the Delos, for example, sounds like a soft blur. 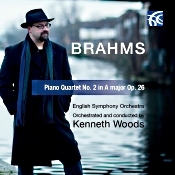 Like many recordings of the Second, this one is spread out over two discs, with the first movement on disc one. (Klemperer is complete on one disc, another point in his favor.) But the turnover is not as inconvenient as one may think, considering that Mahler himself recommended a five-minute break at this point. Delos offer an unusually high number of tracking points within each movement, especially helpful in a work so long. Surely, the peoplel at Delos were aiming for spectacle with their Virtual Reality recordings, and just as surely they achieved it. They have also offered some of their things on DVD, although I have not heard their fully discrete discs in the multichannel medium. The Los Angeles Master Chorale will open its 2018/19 concert season in Walt Disney Concert Hall with two performances of the Mozart Requiem on Saturday, September 22 at 2 PM and Sunday, September 23 at 7 PM. The performances will feature the full 100-voice Master Chorale and Orchestra, and will be conducted by Grant Gershon, Kiki & David Gindler Artistic Director. Guest soloists for the Requiem are Liv Redpath (soprano), J'Nai Bridges (mezzo-soprano), David Portillo (tenor), and Rod Gilfry (baritone). 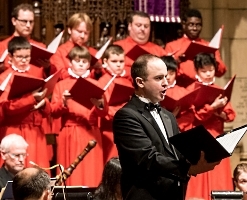 The concerts will open with Shawn Kirchner's Songs of Ascent--a setting of the Psalms sung by pilgrims journeying to Jerusalem--commissioned and premiered by the Master Chorale in 2015 when Kirchner was the Swan Family Composer-in-Residence. These performances will include three Psalms Kirchner has since added to the piece. Mozart's Requiem--the last piece of music he composed and infamous for its mysterious origins and posthumous completion--has been performed by the Los Angeles Master Chorale under each of its directors. It was last performed by Gershon and the Master Chorale in 2009, and the choir most recently performed it with Gustavo Dudamel and the Los Angeles Philharmonic at the Hollywood Bowl in August 2017. 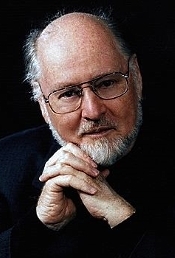 There have been several versions of the Requiem published. 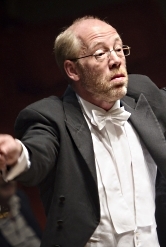 Gershon and the Master Chorale will perform the Franz Xaver Süssmayr version. Süssmayr (1766-1803) is the Austrian composer and conductor credited with completing the Requiem after Mozart's death in 1791. The reverberation of our final performance of Bach's Mass in B Minor has barely stopped ringing through the Conservatory hall on the 9th annual American Bach Soloists Festival & Academy, and as I write this on a typically wonderful foggy San Francisco summer morning, I'm reflecting on the past twelve months and all that ABS has accomplished because of you, our dedicated donors and patrons. We have done so many great things. Thank you! American star conductor Robert Trevino has been confirmed as the new chief conductor of the Malmö Symphony Orchestra (MSO), taking up the post in autumn 2019. 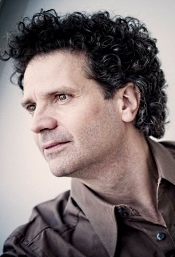 The highly-gifted and in-demand Trevino is in his second season as Music Director of the Basque National Orchestra (which recently extended his tenure to 2022) and is a regular collaborator with orchestras such as the London Symphony Orchestra, Leipzig Gewandhaus, Vienna Symphony, Sao Paulo Symphony, Munich Philharmonic, Accademia Nazionale di Santa Cecilia, the Zurich Tonhalle Orchestra and many others. The now 34-year-old Robert Trevino conducted his first concert as a 16-year-old, with his major international breakthrough coming in December 2013 when he stepped in at short notice to conduct Verdi's Don Carlos at Moscow's Bolshoi Theatre. With a euphoric audience and glowing reviews behind him, he went on to conduct leading orchestras around the world. Season 12 of "Great Performances at the Met" concludes on Sunday, September 9 at 12 p.m. on PBS (check local listings) with Cendrillon, Massenet's operatic take on the classic fairy tale Cinderella, starring Joyce DiDonato as the titular heroine, Alice Coote as Prince Charming, Kathleen Kim as the Fairy Godmother and Stephanie Blythe as Madame de la Haltière. Laurent Pelly's imaginative production takes place in a storybook kingdom. After Cendrillon is forbidden from attending the ball at the palace, her Fairy Godmother appears and gifts her with a coach, a gown and glass slippers that will hide her true identity. At the ball, Prince Charming's mood suddenly changes when Cendrillon arrives, and the two immediately fall in love, but as midnight approaches, Cendrillon hurries away and leaves behind a glass slipper. Bertrand de Billy conducts. Ailyn Pérez hosts. The San Francisco Girls Chorus (SFGC) announced its 2018-2019 40th anniversary season. Led by Valérie Sainte-Agathe in her first season as Artistic Director, SFGC will present four subscription programs starting October 18, 2018 in venues across San Francisco and Berkeley and collaborate with ensembles from the Bay Area and Denmark. Program highlights include world premiere performances of SFGC commissions by Fred Frith, Richard Danielpour, and Aviya Kopelman; debut performances by tenor Nicholas Phan, contralto Kirsten Sollek, and Persian vocalist Mahsa Vahdat; the audience-favorite holiday concert at Davies Symphony Hall featuring Kronos Quartet and women's chorus Musae; and a five-performance summer tour to England and France in July 2019. 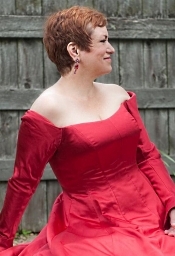 This season's repertoire encompasses a breadth of works from ten prominent women composers that span eleven centuries, including Hildegard von Bingen, Lili and Nadia Boulanger, Talma Louise, Aleksandra Vrebalov, Reena Esmail, Kaija Saariaho, Sarah Kirkland Snider, Mahsa Vahdat and Aviya Kopelman. Following the Friday premiere of Six Evolutions – Bach: Cello Suites, Yo-Yo Ma brings his voice to all Amazon Alexa-enabled devices with Yo-Yo Ma's "Musical Moments." In 36 short episodes, Ma will take listeners on a journey through the music of J.S. Bach, sharing snippets from Six Evolutions and stories from a lifetime of playing Bach's legendary cello suites. A first-of-its-kind for any classical artist, this conversation with Yo-Yo will be available as an Alexa Skill and on Sony "Classical's Today" in "Classical Flash Briefing" on Amazon Alexa-enabled devices. As classical music continues its tremendous growth in streaming on voice-enabled devices, Yo-Yo Ma's "Musical Moments" gives Amazon Alexa users even more ways to explore the genre. The content is designed for anyone who is curious about classical music and its contemporary significance, providing thoughtful commentary from one of our best-known performers. Users can access the skill with the simple voice command, "Alexa, open Yo-Yo Ma's Musical Moments" or by adding "Today in Classical" to their "Flash Briefing" in the Amazon Alexa app, and then saying, "Alexa, what's my Flash Briefing?" Sony Classical honors the great Leonard Bernstein with a celebration of what would have been the cultural icon's 100th birthday. Bernstein, an American composer, conductor, pianist, writer, humanitarian, and twentieth-century pop-culture icon will be celebrated with a two-month social media and streaming campaign built around a new rollout of his popular legacy of recordings that are part of Sony Classical's library. Sony Classical's global campaign will feature eight playlists curated especially for the centennial, that explore Bernstein as composer, conductor, pianist, teacher, Broadway icon, and visionary advocate for the music of Gustav Mahler. Sony Classical will also share a wealth of rarely seen photos, new video interviews with Bernstein's daughter, Jamie, as well as longtime New York Philharmonic archivist, Barbara Hawes. For updates and access to Leonard Bernstein's archival videos and images, be sure to follow Sony Classical on Facebook, Instagram, and Twitter. We are absolutely delighted to share the exciting news that Franco-Belgian star cellist Camille Thomas has joined the Frank Salomon Associates roster for North American representation. We were drawn to Camille's elegant, passionate musicality paired with an effortless virtuosity and are thrilled to have the opportunity to share her artistry with audiences on this side of the ocean. Camille comes to us as one of the most exciting young artists in Europe. Her numerous accolades and awards include being Deutsche Grammophon's first-ever female cellist (and first cellist in over 40 years); being listed on Forbes' 30 under 30 for European Art & Culture; and being selected as the European Broadcasting Union's "New Talent of the Year" in 2014. From sold-out concert halls throughout Japan and an international choral competition in British Columbia to performances with Lincoln Center and The Classical Theatre of Harlem, Young People's Chorus of New York City is making the most of its 30th Anniversary summer. With a full schedule of workshops, cultural exchanges, and concerts conducted by Artistic Director/Founder Francisco J. Núñez, YPC's choristers recently returned from bringing their extraordinary tour program of music and dance to audiences in 15 Japanese cities. The concert-goers were so spirited that in Osaka, the audience members would not let the singers leave the stage until they had performed a record-breaking six encores! Also Wolf: Italian Serenade; Mozart: Eine kleine Nachtmusik. Andreas Haefliger, piano; Joseph Carver, double bass; Takacs Quartet. London 289 460 034-2. I once wrote that there were as many "Trout" recordings in the music world as there were fish in the sea. If I didn't, I should have. Sometimes we wonder why record companies keep releasing the same tired, old stuff over and over again, but in the case of Schubert's "Trout," there is ample justification. This 1999 recording will appear to some listeners as sparkling with freshness and to others as infuriating in its garden-variety plainness. Whatever, it's another interpretation to consider. With Andreas Haefliger, piano, and Joseph Carver, double bass, the Takacs Quartet take on three popular chamber pieces from Schubert, Wolf, and Mozart. Overall, they do acceptable work, but whether any of the performances are better than old favorites in this repertoire I find doubtful. 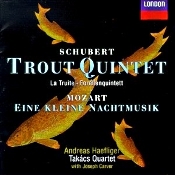 The Takacs's take on Franz Schubert's Piano Quintet in A major "Trout" begins more intensely than most, with rhythms well sprung and accents keenly punctuated. It is a far cry from the leisurely but for me more charming "Trout" I reviewed a year earlier by Alfred Brendel and company (Philips). The next two movements appear far more conventional but still fairly expressive. The central set of variations is given some persuasive turns, although in this regard they are not as infectious as those in my favored recording from an augmented Beaux Arts Trio (like the Brendel, also on Philips but also on Pentatone). It is in the finale, however, that the greatest controversy may arise. The Takacs ensemble take it much faster than usual, but never breathlessly so. In fact, it seems just right for the moment, and comparisons to the other recordings I've mentioned find those performances almost hopelessly dragging. Of course, they're not. It's the danger of comparisons; taking bits and pieces out of context makes them appear unfairly different. There is obvious charm in taking things slowly, yet the exhilarating pace of the Takacs group creates its own delights. And as for what is actually "right," Schubert's only indication for the last movement is Allegro giusto (cheerful, joyful, usually fast, and fitting or just right), which is a pretty broad tempo marking, allowing for a lot of interpretative leeway. At least we know Schubert wanted something a little fast and lively, and he gets it here, for better or for worse. As for couplings, Hugo Wolf's diminutive Italian Serenade is a serviceable transition into Mozart's familiar Serenade in G major, "Eine kleine Nachtmusik." The Mozart, too, is given a much more sprightly reading than we commonly hear and combined with the added clarity of a small group makes listening to this piece a fresh, if not entirely rewarding, experience. Again, the approach Takacs takes will annoy those people whose expectations are more traditional, while others will find all three pieces original and more than satisfactory. When Decca discontinued their London label in America, they repackaged much of their catalogue under the original Decca name, but they never seemed to have gotten around to this issue. Nevertheless, I see a number of London copies still around under the old designation. Anyway, Decca's sound is not always as well defined as I would have liked, but it is well balanced, particularly front to back, and it adds to the disc's enjoyment. Marion Rampal, vocals; Quatuor Manfred; Raphael Imbert, saxophone and bass clarinet. Harmonia Mundi HMM 902295. In order to give you an idea of the theme behind this album, I quote from the booklet note, which does a better job than I could do: "English writer Christopher Iserwood's fictionalised Berlin memoirs, Goodbye to Berlin, provided the title for the 1951 Broadway play I am a camera, adapted from Isherwood's novel. His stories also later inspired the 1966 musical comedy Cabaret (notably starring Lotte Lenya) and the scenario for Bob Fosse's 1972 film version. Writing after his departure from Berlin in 1933, Isherwood's optical metaphor evokes one of the most striking and characteristic aesthetic principles that influenced all cultural life in 1920s Berlin, that of 'Neue Sachlichkeit,' or 'New Objectivity.' The movement was considered the essence of modernity, as practised and theorized by many artists." The album Bye-Bye Berlin includes seventeen songs, airs, and lieder from the 1920s Berlin era, composed by such notable persons as Kurt Weill, Paul Hindemith, Hanns Eisler, Friedrich Hollaender, Bertolt Brecht, and others. 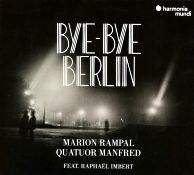 The French singer-songwriter Marion Rampal (no relation to the Jean-Pierre Rampal) does the vocals, accompanied by the Quatuor Manfred, a quartet made up of Marie Bereau, violin; Luigi Vecchioni, violin; Emmanuel Haratyk, viola; and Christian Wolff, cello; and featuring Raphael Imbert on saxophones and bass clarinet. Ms. Rampal is principally a jazz singer, with a wonderful range, and does up the songs in both German and French. Her accompaniment is principally a classical quartet, but they adapt nicely to the more-popular rhythms of the jazz-inflected music; and Mr. Imbert is principally a jazz and improvisation artist who provides a strong backbone for most of the scores. The program presents a fascinating and enlightening look at the cabaret scene in Berlin in the 1920's and early 30's. 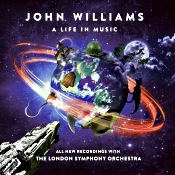 More important, it's well sung and well performed by the jazz and classical artists involved. Ms. Rampal's dark-toned vocals have a kind of longing, melancholy tinge to them, as though trying to make us aware of the hope of an age and, from a future perspective, the horrors to follow. The accompaniment supports her with a mutual compassion, appearing to share the contradictions of the music. Favorites? As usual, some things struck me as a tad bland, while many others were hard to resist. The opening Kurt Weill song sets the tone for the album. The sorrowful instrumental by Erwin Schulhoff that follows makes a skillful transition into the familiar "Mack the Knife" tune. And so it goes. Listeners who appreciate the musical Cabaret or just listeners who appreciate classical or jazz music will doubtless find the selections of interest. Finally, an informative, forty-odd-page set of booklet notes in several languages complete the package. Musically and sonically, it's is a worthy treat. Producer Alban Moraud and the Alban Morand Studio made the recordings at Cite de la Voix, Vezelay, France in November 2016. The voice is nicely placed in the center front, with the ensemble realistically laid out behind her. The frequency balance seems nearly perfect, although the instruments tend very occasionally to overpower the vocals. So, one can hardly fault the sonics, which come through in lifelike fashion. The Music Institute of Chicago welcomes back alumna violinist Jennifer Koh for the opening concert of its 2018–19 Faculty and Guest Artist Series Saturday, September 15 at 7:30 p.m. at the historic Nichols Concert Hall, 1490 Chicago Avenue in downtown Evanston, Illinois. 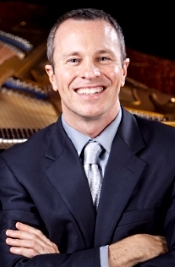 The acclaimed Glen Ellyn native returns to play a program featuring two solo works by Bach--Sonata No. 1 in G minor and Sonata No. 3 in C Major--juxtaposed with a contemporary piece for solo violin, For Violin Alone, by John Harbison. 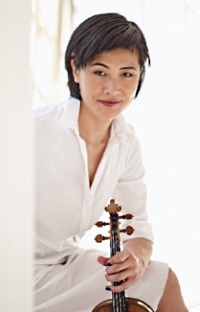 Critics have described her playing of the Bach Sonatas and Partitas as intense, beautifully shaped, and mesmerizing. "Koh's arresting tone and emotional interpretations of Bach are a perfect fit for the acoustics of Nichols Concert Hall," said Music Institute President and CEO Mark George. Violinist Jennifer Koh is recognized for commanding performances delivered with dazzling virtuosity and technical assurance. An adventurous musician, she collaborates with artists from multiple disciplines and curates projects that find connections between music of all eras from traditional to contemporary. There is new video available from "Great Performances: Vienna Philharmonic Summer Night Concert 2018," led by guest conductor Valery Gergiev, which aired Friday, August 17 on PBS. The world-renowned Vienna Philharmonic returned for its 15th open-air concert, with the Baroque gardens of Austria's Imperial Schönbrunn Palace serving as the magnificent backdrop. The program featured internationally acclaimed soprano Anna Netrebko as special guest soloist and celebrated Italian operatic masters, with works by Rossini, Verdi and Puccini. The "sublimely exploratory" (The Chicago Reader) Wet Ink Ensemble announces its fall 2018 concerts in New York City, celebrating the group's 20th anniversary season as a collective of composers, improvisers, and interpreters at the forefront of the performance and presentation of adventurous music. Described by Time Out New York as "a group [that] doesn't so much cross boundaries as disregard them," Wet Ink Ensemble's fall 2018 season includes a double album release event at The DiMenna Center, Miller Theatre at Columbia University's Composer Portrait of Kate Soper, a performance at the For/With Festival, a performance with Darius Jones as part of "For The People" at Roulette, and a collaboration with Peter Evans' Being & Becoming Ensemble at St. Peter's Church in Chelsea. The 2018-19 Season comprises 35 performances representing the finest talent across a variety of genres including classical, jazz, folk, and popular music; world music and dance. Venues include the traditional 1,400-seat Weill Hall, a new setup in Weill Hall called The Loft, which reimagines the concert experience by spinning performers and audiences around to see and hear from a whole new perspective, and the intimate 240-seat Schroeder Hall. All at Green Music Center, Sonoma State Unviersity, Rohnert Park, CA. Single tickets are now on sale, or save with subscription packages. Critically acclaimed Austrian-Persian cellist, Kian Soltani, will be performing throughout the United States this season, with dates ranging from August of 2018 to May of 2019. Beginning with the Bernstein Centennial Celebration at Tanglewood, Soltani will perform in a total of nine concerts with ensembles including the Boston Symphony Orchestra, the West-Eastern Divan Orchestra, and the National Symphony Orchestra, culminating in his recital debut at Carnegie Hall. Winner of the 2018 Grammy Award for Best Choral Performance, The Crossing, led by conductor Donald Nally, performs of arms and the man on Wednesday, September 19, 2018 at 7:30 p.m. and Thursday, September 20, 2018 at 7:30 p.m. at New York's Park Avenue Armory. The evenings will feature the 24-voice ensemble of The Crossing with three cellists (Thomas Mesa, Arlen Hlusko, and Sujin Lee) and will explore the timeless themes of nationalism and war while navigating personal stories of joy and despair. of arms and the man is designed to utilize the Armory's historic reception rooms with cello solos punctuating the transitions between the spaces. The program features a New York premiere by 2018 Pulitzer Prize finalist Ted Hearne, the nation's preeminent composer of works of social advocacy, co-commissioned by Park Avenue Armory and The Crossing. Donald Nally describes, "The concert takes a look at life and war and life during war from a number of angles: national pride, grief, and anger. Ted's new piece is going to fit into this overall theme of how we agree or disagree across nations and continents and what we're actually doing when we act on those alliances or arguments. In of arms and the man, The Crossing continues to ask complex questions for which there may be no easy answers." American Classical Orchestra (ACO) kicks off its 2018-19 season on Wednesday, September 26, 2018 at 8:00pm in Alice Tully Hall at Lincoln Center with "Mozart Serenade," a concert of festive music by Mozart. ACO is joined by acclaimed period violinist Krista Bennion Feeney in Mozart's Haffner Serenade and will use contrabasses instead of cellos as is indicated in the original score, creating a refreshingly transparent sound. Pianist Christian De Luca, a virtuosic Juilliard historical performance program graduate, makes his Lincoln Center debut on fortepiano in Mozart's Piano Concerto No. 21 in C Major, a work popularized in the Swedish film Elvira Madigan. The 2018-2019 season marks the orchestra's 34th year of presenting historically accurate, engaging, and educational concerts, led by Artistic Director and Founder Thomas Crawford. Crawford writes, "Our September program is a rare opportunity to hear the fabulous Haffner family wedding music of 1776 on period instruments. This music is paired on the program with Mozart's most well-known of all concertos, No. 21, here performed on the dulcet tones of a 1780 fortepiano. The serene slow movement, loved by millions, is given an intimate portrayal that is both revealing and evocative of another world in another time." The Wallace Foundation announced today that Bahia Ramos will become the foundation's new Director of Arts, succeeding Daniel Windham who is retiring at the end of September. Ramos, most recently the National Director/Arts at the Miami-based John S. and James L. Knight Foundation, will join Wallace on September 6, 2018. 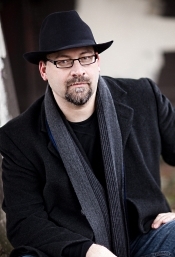 As Director of Arts, Ramos will lead the arts program unit and the interdisciplinary team responsible for the strategic design and implementation of Wallace's initiatives in the arts, including Building Audiences for Sustainability, the foundation's current initiative funding 25 performing arts organizations in their audience-building efforts. She will also lead Wallace's work in arts education, which seeks to increase the equitable access to high-quality arts education for young people, especially those in high-poverty urban areas. Artistic Director Michelle Djokic and Musikiwest, a Palo Alto-based chamber ensemble featuring professional musicians from all over the country, opens its 2018-2019 season on Thursday, September 20, 7:30 p.m. at the Mitchell Park Community Center in Palo Alto. Spanning three centuries and incorporating works inspired by world music, the program will feature three string quartets - John Zorn's Kol Nidre, Kevin Volans's White Man Sleeps and Arvo Pärt's Fratres – as well as Mendelssohn's chamber masterwork Quintet in B flat Major, Op. 87. This season's performances are sponsored by the City of Palo Alto. Musikiwest's core mission is to help build peaceable communities using the collaborative nature of chamber music. Prior to their public concert, the musicians of Musikiwest will stage three to four "open rehearsals" for local middle and high schools that will address issues such as bullying, shaming and exclusivity. Unknown to the participants, the rehearsal exchanges between musicians are entirely scripted, creating a deeper connection and awareness to the process. Rona Hu MD, Clinical Associate Professor of Psychiatry and Behavioral Sciences at Stanford University and founder of CHIPAO, serves as moderator for the open rehearsals, maintaining an interactive dialogue with the audience as they uncover the art of conflict resolution. Single tickets are $10 and $15 and can be purchased through Event Brite at http://www.eventbrite.com. Admission is free for patrons under 18. Composer Julia Adolphe will see her new orchestral work, Underneath the Sheen, premiered by the Los Angeles Philharmonic this September as part of the orchestra's centennial season celebration. Additionally, Adolphe's new comic opera, A Barrel of Laughs, A Vale of Tears, will be a Project-in-Residence at National Sawdust. In commemoration of their centennial year, the Los Angeles Philharmonic has commissioned over 50 new works from the world's leading composers to be premiered throughout their 2018-19 season. 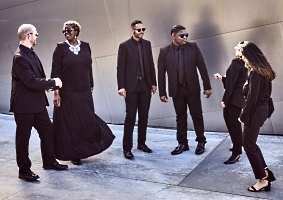 Adolphe's Underneath the Sheen will premiere on September 27, 2018, as part of their opening night concert and gala event, California Soul, joining a California-centric concert program conducted by Gustavo Dudamel. In addition, as one of four Projects-in-Residence at National Sawdust this season, Adolphe is collaborating with librettist Stephanie Fleischmann and director Elkhanah Pulitzer to adapt Jules Feiffer's loopy fairytale, A Barrel of Laughs, A Vale of Tears, into an opera for all ages. Celebrating this banner year, the Solera Quartet's debut album, "Every Moment Present," is due for release on September 25th, 2018. Comprised of three poignant string quartets by Mendelssohn, Janácek, and Caroline Shaw, the album explores the role of obsessive thought as creative muse. San Francisco's 42nd Street Moon (Daren A.C. Carollo and Daniel Thomas, Co-Executive Directors) has announced the cast and creative team for the upcoming special engagement of Stephen Sondheim's Tony Award-winning musical Follies in concert. Also, Festival Overture; The Mountain King; Uppsala Rhapsody. Niklas Willen, Royal Scottish National Orchestra. Naxos 8.553962. Composer, conductor, and violinist Hugo Alfven (1872-1960) was among Sweden's most-popular classical composers of his day, and this Naxos collection presents a well-rounded picture of the man's work. Most of it sounds like late-Romantic fare, with an emphasis on the programmatic. The selections begin with the Festival Overture, a somewhat blustery, bombastic piece that, nevertheless, makes a good, rousing curtain raiser. So, it works in the capacity for which the composer doubtless intended it. Maestro Niklas Willen and the Royal Scottish National Orchestra give it their all, and if one doesn't expect something more substantial, it does its job. The suite that follows, from the ballet The Mountain King, is more temperate, a series of picturesque tone poems based on old Swedish legends. All four sections of the suite are colorful, the two middle parts the most charming. Overall, though, it sounds for the all the world like second-string Grieg. The Uppsala or Swedish Rhapsody that comes next is a cavalcade of familiar Swedish college songs, including a few drinking songs that the college that commissioned the work disapproved of. It bears a superficial resemblance to Brahms's Academic Festival Overture and comes to a stirring conclusion. 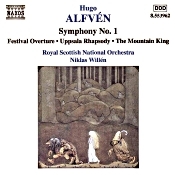 The real substance of the disc, however, is Alfven's Symphony No. 1, written in 1897 when the composer was only in his mid twenties. It is a serious work, though not somber. The first movement alternates between light and shadow, between playfulness and dead earnestness. It's hard to find a focus in this opening music, yet it seems to sum up the whole piece. The slow, second movement is overtly Romantic, with lush melodies in abundance. The Scherzo is somewhat too exuberant and becomes tiresome and repetitious. But the concluding Allegro is most engaging, weaving a balletic grace in with its weighty intentions, conductor Willen managing the high-wire act with an appropriate balance. The sound Naxos provides for the Royal Scottish Orchestra is startlingly real, if a bit dark and heavy. In fact, it's rather huge in size, with a thunderously deep bass impact. The stereo spread is wide; the clarity, in spite of some mid-bass heaviness, is impressive; and the depth of field is more than adequate. 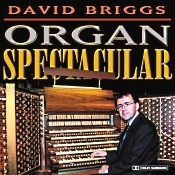 This is what some people might have called a stereo spectacular in the old days. Today it's more commonplace to find good, dynamic sonics on a disc; but at a medium a price it comes as a pleasant bonus to some unusual music. Overall, the disc makes a release worth considering. 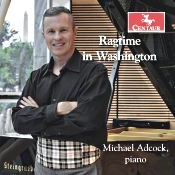 Michael Adcock, piano. Centaur Records CRC 3639.